I put together a video of my painting “Near Garrapata State Park” from start to finish, by stitching together photos of the work in progress. 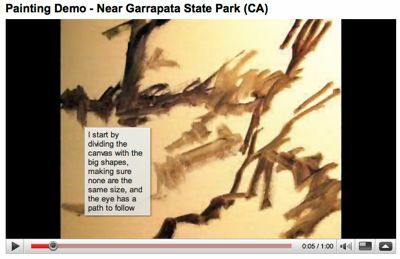 I used YouTube’s new annotations feature to add notes on my process. It’s short (exactly 1 minute), but I think it demonstrates my approach well. Click here for a list of video demos on my blog. Enjoy!